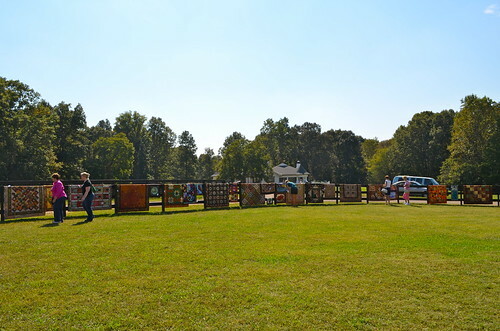 I was able to leave my football watching boys for a few hours today to go to the Fox Family Farm in Waxhaw for Barnful of Quilts. 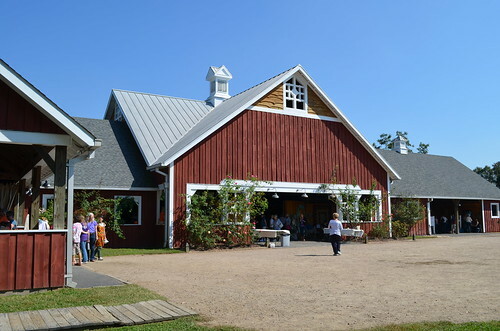 My mother-in-law recently joined the Charlotte Modern Quilt Guild and arranged for us to have a stall (they actually clean out the horse stalls in the beautiful barn to use for the show). So it was pretty cool to see some of my own quilts on display! This post is pretty picture heavy and there are even more HERE on my Barnful of Quilts flickr set. My mother-in-law, Fran Lyons, whipped up this little beauty last night! I think she said she sewed the binding on while they were driving to the fundraiser at the barn last night! Here are my little minis on the wall in the CMQG stall. That $3.00 sign is for some fat quarters we sold. Fran and I (mostly Fran) cleaned out some excess fabric and made little bundles to sell so we could make a contribution from CMQG to Samaratin's Purse (the charity chosen for Barnful of Quilts this year). We raised $155! 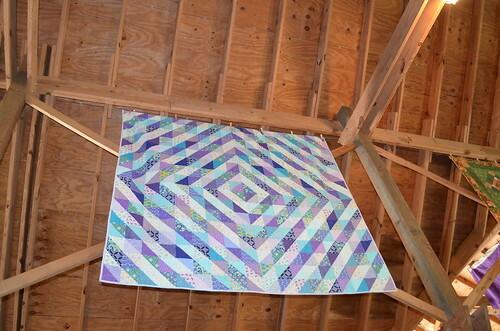 Here's my Patchwork Prism Quilt right as you walk into the barn. See it hanging in the doorway? Pretty cool! 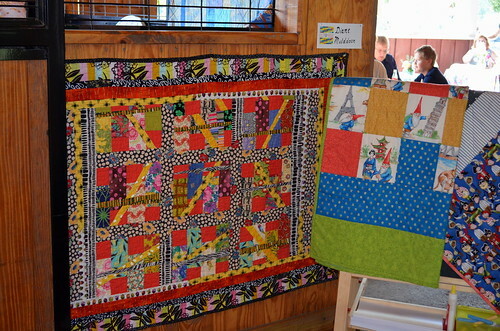 Here's Diane's lovely quilt hanging outside of the CMQG stall and Fran's gnome quilt. This is one of the Habitat Challenge Quilts the guild made, which will be going to a charity soon. I love the quilting pattern on this one, although I'm not sure who to credit for the quilting. 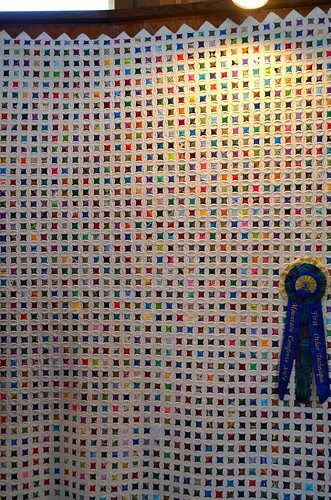 Beth Pinkney's HST quilt is hanging high up in the rafters. Sandra Wright was the featured quilt artist this year and had many amazing quilts on display. 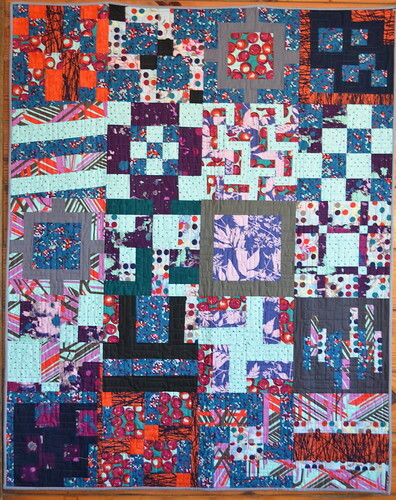 I was quite smitten by this scrappy Cathedral Window quilt. 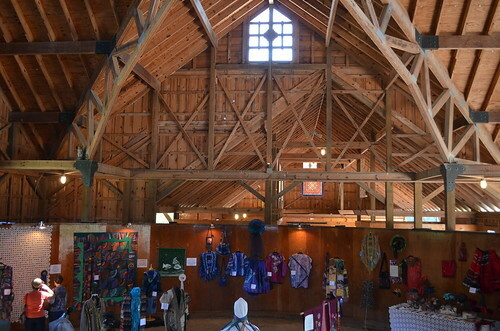 I took this photo from the second story and you can see more of Sandra's work (quilts and garments). 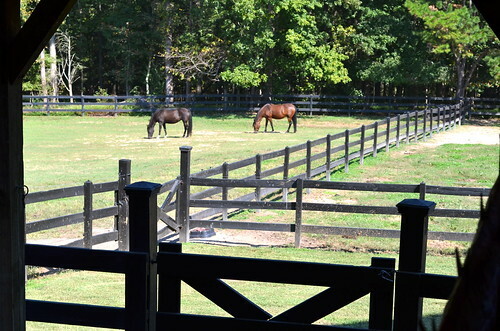 Here we have the displaced residents of the barn enjoying some time in the pasture. I hope you enjoyed this little recap of the show. It was a beautiful day to be outside enjoying the quilts. 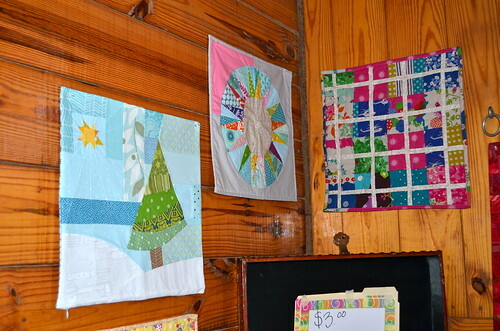 Oh, and there were quite a lot more beautiful quilts from guild members on display. I should have taken pictures of all of them, and I got distracted. So I am so sorry if I missed yous. 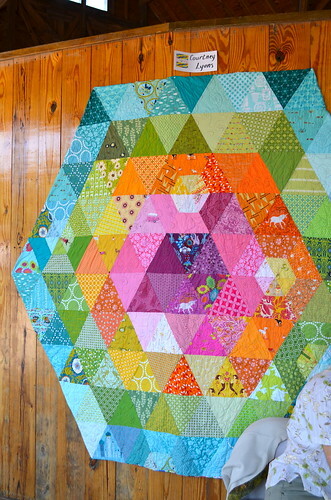 Looks amazing, and all your quilts look fantastic! Well done for raising money too! I so enjoyed meeting Fran at the last CMQG meeting, my first! I'll be back. 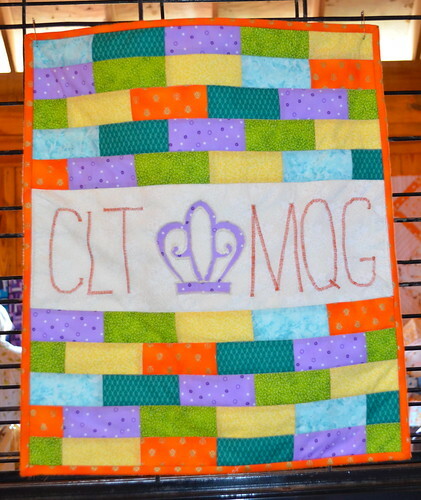 The Barnful of Quilts was amazing and the CMQG beautifully represented! 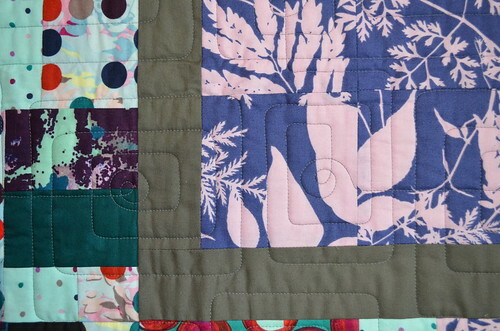 I loved seeing your quilts and look forward to meeting you at a guild meeting. btw... i love your prism quilt.